The ASA AirClassics Pilot Backpack delivers the functionality and practicality students and pilots need to conveniently transport books and pilot supplies on the ground, in the air, from campus to the airport, and everywhere in between. Made of durable fabric and supported by a heavy-duty water-resistant bottom, this backpack keeps books and supplies organized and protected. 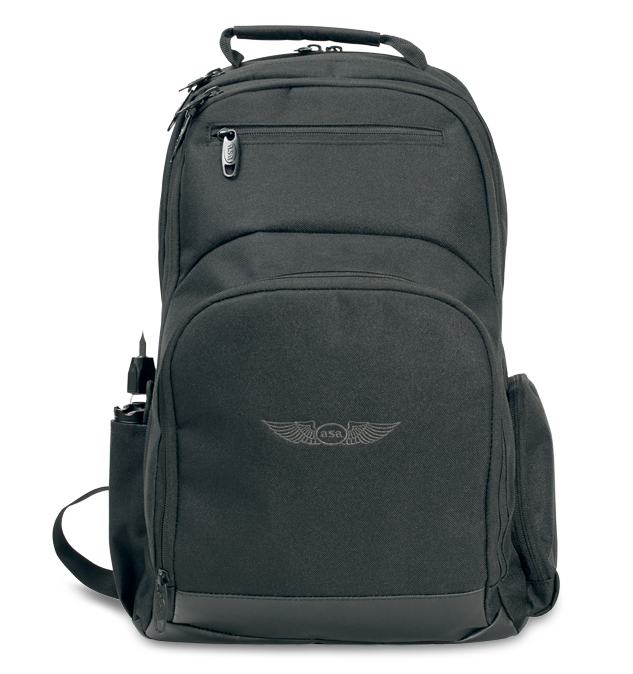 Four zippered compartments provide ample room for just about anything a pilot-on-the-go needs. The front pocket will accommodate most aviation headsets. The second level interior compartment has a lanyard for keys, a zippered containment pouch, and plenty of pockets and slots for pens, pencils, flight computers and plotters. The spacious main compartment supports textbooks and manuals, and the checkpoint-friendly fold-down back panel contains a padded pocket for a laptop, and a felt-lined pocket for a tablet. The backpack's interior contrasting-color lining makes it east to find things inside. Focusing on a clean, sophisticated and professional look, the ASA AirClassics Pilot Backpack is designed and engineered to be supremely functional, able to stand up to the toughest treatment possible, yet still look great at the end of the day. Review: This was a Christmas gift to my nephew and he loves it. Review: Comfortable, spacious and very well though-out. You have pockets for everything: eyeglasses, headset, fuel gauge and tester, plenty of pen holders. On ASA website they suggest putting their headset pouch inside the headset pocket, so I was wondering if the pocket itself has any padding. It does, so you can use it without extra pouch. Was this review helpful to you? Yes No 29 Other people found this review helpful.